If you and your family are relocating to Fort Hunter Liggett or Camp Roberts, CA as a result of a base realignment (BRAC), you will find this area has so much to offer. From outstanding recreational amenities like horseback riding, camping, hiking, tennis, water sports on beautiful Lake Nacimiento and Lake San Antonio to an abundant selection of homes, the Monterey and San Luis Obispo County area’s have it all. And we are here to protect your move! No doubt you are here to gather information on this wonderful area. Spread over 165,000 acres, Fort Hunter Liggett is the largest US Army Reserve Command post in the United States. Fort Hunter Liggett provides an excellent environment for the ultimate training exercises for all types of units including the Battalion Plus armored task force maneuvers and aviation training with a C-130 assault strip and a regulation Army helipad. 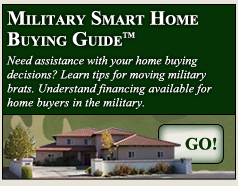 Those moving with the military will appreciate the resources offered here in the Military Smart Home Buying Center tm. Those in the information gathering stage will find information-rich articles on securing a VA loan, mortgage pre-qualification, great local information about Oak Shores, Paso Robles, Heritage Ranch and King City plus easy-to-use search tools and exclusive online content to help you find your next home. Download your copy today! It is important to note that not everyone serving in the military lives on the post. Many military families opt to live in safe, comfortable communities located nearby. The close proximity of Oak Shores, Heritage Ranch, Paso Robles to the south, San Miguel to the southeast, and King City to the north of Fort Hunter Liggett make these communities an excellent choice for families who desire to live a superior quality of life with the bonus of excellent local schools.